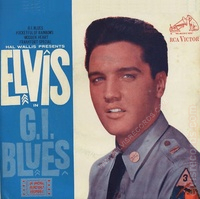 These images of G.I. Blues extended play were sent requesting verification and validation as it is not listed in any price guide or publication. This example was offered in 2010 with the description, U.S. promo releases made and distributed in 1960 for the Sears Roebuck & Company stores and given out free with the purchase of any U.S. Army jacket windbreaker.1 What confuses the issue is that it reads Made in U.S.A. on the labels. This is not an expert analysis, however, after collecting for many years and reviewing 1000s of images, there are patterns that develop. This example are many inconsistancies that support the conclusion that this is a bootleg. 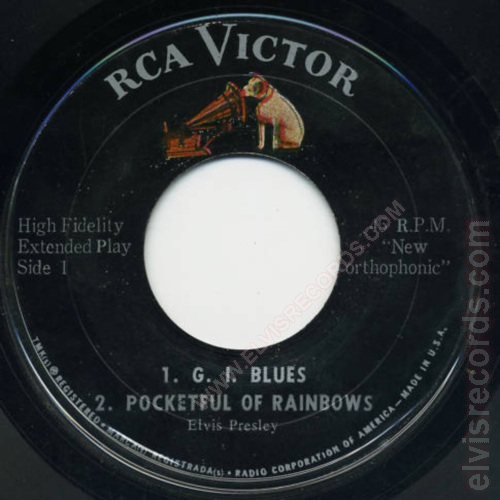 If for no other reason, the RCA Victor logo used on the cover is not 1960, however at least two years later. This does not support the story of its Sears Roebuck & Company origin. Incorrect RCA Victor logo. Behind the RCA Victor logo is the original LP rectangle box faded out with newer Nipper logo. In 1960, the logo would be rectangle box, Elvis' first 45 RPM with that logo is from 6/8/1966 47-8870 Love Letters / Come What May. First album, 6/5/1962 LPM-2523 Pot Luck. First EP is 3/10/1967 EPA-4387 Easy Come, Easy Go. Nipper is too dark, has a haze around the edges of the image as if it were cut and pasted from an original source. No catalog number or matrix number. High Fidelity on one side and new orthophonic on the other side. EPs of this era are not found with Extended Play spelled out or with 45 R.P.M. but with 45 EP. 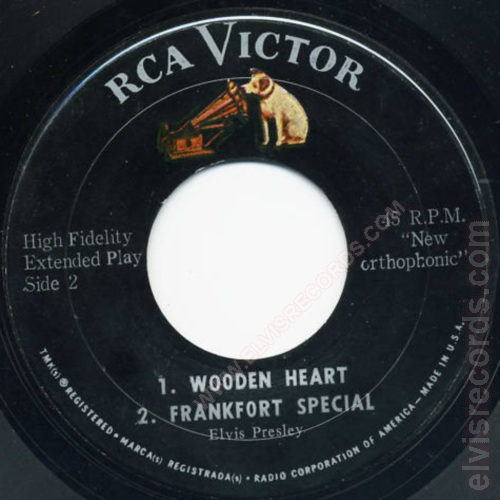 No credit for "with The Jordanaires" for Frankfort Special or G.I. Blues. 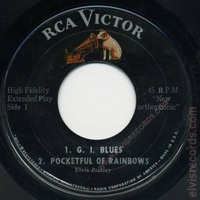 Odd font used for High Fidelity, Extended Play, Side 2, 45 R.P.M. "New orthophonic" and Elvis Presley. The inner ring that cuts through Nippers ear is not indicative of any other U.S. pressing of that era.